Ulcer-loss of the epidermis, with adjacent epidermal hyperplasia and underlying inflammation (arrow), in a male B6C3F1 mouse from a chronic study. Ulcer-loss of the epidermis, including the basement membrane (arrow), in a male B6C3F1 mouse from a chronic study. Epidermal ulcers ( Figure 1 and Figure 2 ) are among the most common spontaneous findings in mice and rats but may also be associated with dermal application of test agents. Ulcers are characterized by segmental or more extensive loss of the epidermis, including the basement membrane, with exposure of the underlying dermis. Erosion is characterized by the partial loss of the epithelium, with the basement membrane left intact. 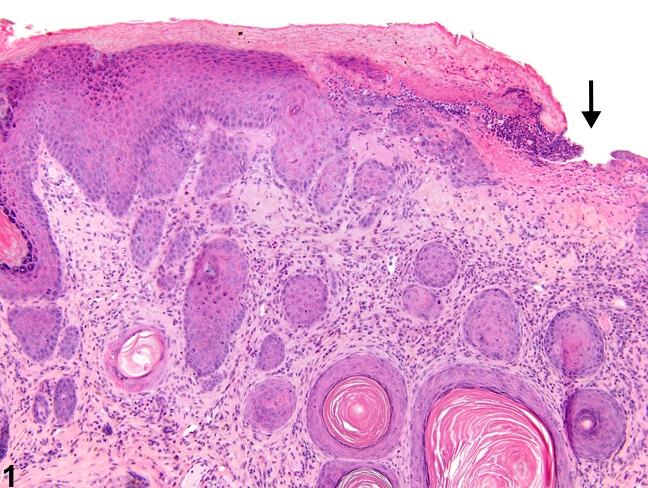 Erosions can be subtle, shallow lesions with loss of only the upper layers of cells and may be difficult to identify. Unless they are peracute, these lesions are typically accompanied by inflammation in the superficial dermis and may be accompanied by epidermal hyperplasia, particularly at the edges of ulcers. With severe ulcers, the inflammation may extend into the deep dermis or subcutis. With chronicity, there may be neovascularization and fibrosis as part of the healing response. Whenever present, epidermal ulcerations and erosions should be documented and assigned a severity grade. Associated findings, such as inflammation, epidermal hyperplasia, hyperkeratosis, edema, or dermal fibrosis, should be described in the pathology narrative and not diagnosed separately unless, in the pathologist's judgment, a separate diagnosis is warranted. Elwell MR, Stedman MA, Kovatch RM. 1990. Skin and subcutis. In: Pathology of the Fischer Rat: Reference and Atlas (Boorman GA, Eustis SL, Elwell MR, Montgomery CA, MacKenzie WF, eds). Academic Press, San Diego, 261–277. Klein-Szanto AJP, Conti CJ. 2002. Skin and oral mucosa. In: Handbook of Toxicologic Pathology, 2nd ed (Haschek WM, Rousseaux CG, Wallig MA, eds). Academic Press, San Diego, 2:85-116. Peckham JC, Heider K. 1999. Skin and subcutis. In: Pathology of the Mouse: Reference and Atlas (Maronpot RR, Boorman GA, Gaul BW, eds). Cache River Press, Vienna, IL, 555-612.